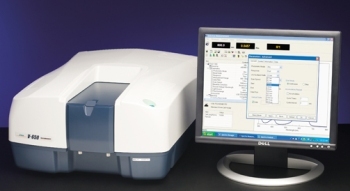 The V-650 is a double-beam spectrophotometer with a photomultiplier tube (PMT) detector. The high sensitivity of the PMT enables accurate measurements of low (and high) concentration samples. By controlling the high voltage applied to the PM tube, the dynode feedback circuit allows a wider dynamic range. It also enables the use of such solid sample handling accessories as integrating spheres to collect diffuse light transmitted or reflected by the sample. The advanced optical design results in high optical throughput and allows the bandwidth to be set as low as 0.1 nm for high resolution work such as gas and vapor phase spectroscopy. Low stray light slit settings provide excellent linearity of up to 4 absorbance units. Two graphical user interfaces are available including a newly redesigned intelligent remote module (iRM) with a color LCD touch screen and Spectra Manager™ II software, the latest version of JASCO's innovative cross-platform spectroscopy software. Both of these interfaces allow full system control and advanced data processing. Spectra Manager CFR is a 21 CFR part 11 compliant version of software and is available as an option.